You hear it everywhere, hashtag this, hashtag that! But what exactly is a hashtag? Hashtags are a function of social media platforms that help boost posts to a greater audience by attaching a post to a keyword that consolidates all posts with that same keyword into one place, generally a social media feed. Facebook most recently introduced the hashtag to its platform in 2015 (Sprout Social), which begs the question – are hashtags still important for marketers or have them become more social than useful? Read on for a crash-course in hashtags. Hashtag was declared the Word of the Year for 2012 (Visual Thesaurus) and by definition is “A word or phrase preceded by a hash sign (#), used on social media websites and applications, especially Twitter, to identify messages on a specific topic” (English Oxford Living Dictionaries). Hashtags are used across various social media platforms to categorize user posts or tweets so they can be more easily found and make it a part of a larger conversation topic. They are used after a caption or sentence to summarize the topics it contains. This makes it easier for users to search trending topics or related articles of interest. Additionally, hashtags are a way for users to interact with marketing posts aside from links or Call-to-actions. Hashtags can also help to increase engagement and interactions with your post. For example, on Instagram, posts with hashtags receive 12.6% more engagement than those without hashtags (Sprout Social). On Twitter, the results are even more significant: “Tweets with hashtags had 2 times more engagement than those without, and 55% more Retweets” (Sprout Social). Hashtags have a variety of uses – they can be used to promote and tag your brand or used as a slogan. You can even use hashtags to promote special events. DO: make sure your hashtags are clear and concise. Combining too many words or making too lengthy of a hashtag can make it difficult to remember and dissuade users from using it. Create a signature hashtag for your brand, whether you use your brand name, your slogan, or a mixture of things, be sure to use it on all your posts consistently. This helps with brand recognition, allows you to be discovered by users, and allows others to connect that hashtag with your brand. DON’T: use irrelevant hashtags for your post or Tweet – this causes user confusion and annoys users who are trying to search for relevant content. As attractive as it may be to use “#CatsOfInstagram” to harness the millions of users searching that hashtag, if your post doesn’t have a cat, don’t do it – you’ll get flagged and your post may be taken down. (Sprout Social). DO: be sure to have some fun! Hashtags are not only relevant, but they are also a major player in the social media cultural zeitgeist – make sure you meet social media users where they are. In short, don’t be boring. Hashtags should be a fun addition to your social media posts, adding a human face to your brand! Find something that sets you apart and run with it! 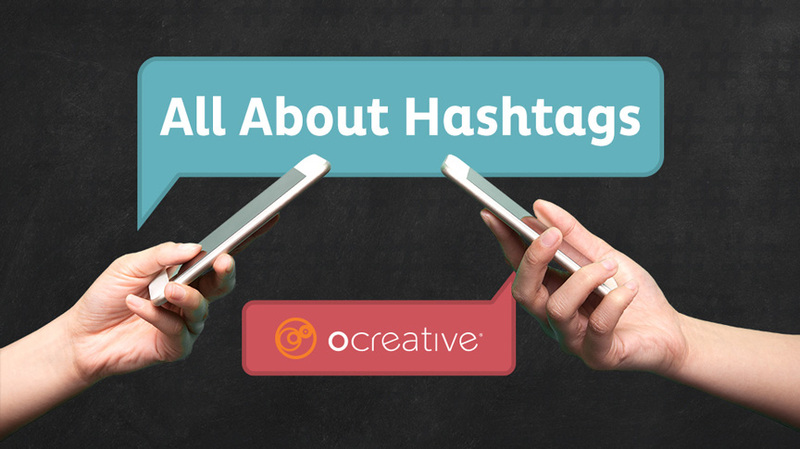 If you are unsure how to incorporate hashtags into your social media initiatives, contact Ocreative today!